Zesty fresh Asian chicken salad served Mexican taco style! Move over grilled Mexican meat, there’s a new kid on the block with an exciting bold Asian kick! Delicious chicken seasoned to sour, salty, spicy and nutty perfection. Topped with fresh aromatic herbs and all wrapped up in a taco. Chicken, Lime, and cilantro what could be a more Mexican combination? Chicken, lime and cilantro, what could be a more Asian combination? Wait, what? Exactly! It’s a combination proven around the world! While you will find fresh cilantro and lime as toppings for delicious grilled chicken in Mexico, you often find them in delicious salads when in South East Asia. Time to create another fusion food love child! Larb salad made from lime marinated chicken, therefore, makes for a perfect substitute in delicious tacos. Packed with flavor, aromatic herbs, and crunchy toppings, this salad is more than worthy to enter the taco filling beauty contest 2018! I always thought that the Larb salad was from Thailand. Well, turns out it’s actually a dish from Laos. The flavors in this dish are classical combinations that have proven themselves over and over again. Fish sauce, lime juice, and brown sugar is a combo that can be found a lot in South East Asian cooking, while cilantro and lime are not only found there but in South American cuisine as well. You can find these classic combos in my second book Flavor Math, as #2 and #7. The book features 33 flavor combinations that are tried & trusted around the world (like the ones mentioned), but on top, you will find 33 pairings that are exciting, daring and will spark your creativity! My second book “Flavor Math” is available digitally (PDF) as well! The ratio of cilantro and mint in this salad is up to you! I prefer my larb salad to have more of a cilantro than a mint taste, but I know that some people like it rather the other way around. Whatever floats your boat – go for it! One ingredient that’s crucial in larb salads is roasted rice powder (Khao Khua). It’s very easy to make at home. The only things that you need are rice, a skillet, a mortar, and pestle. Toast the uncooked rice grains in a pan over medium-high heat until it’s fragrant and slightly browned. Crush it in the mortar until you have tiny sand grain-like pieces. Done! In a closed container it stays crunchy and fragrant for a few weeks. In case you want to make this dish vegetarian or vegan, replace the chicken with mushrooms. Button mushrooms work perfectly for this. Slice the mushrooms and cook them over high heat with the juice of only 1 lime (instead of 2) and 50ml vegetable broth until all liquid is evaporated. 600g ground chicken meat – either buy minced chicken or finely chop up chicken thighs for even more flavor! You want the zest of 1 lime but the juice of 2. So zest 1 lime, but juice both of them. Reserve the zest for later. Mix the lime juice and 1 tablespoon of fish sauce with the minced chicken. Cut the red onion into thin slices. Put a large skillet onto high heat and once hot, add the chicken. Keep stirring and breaking up the chicken into smaller pieces, for about 6-8 minutes. You don’t want big chunks. Once the chicken is cooked through and starts to brown, turn off the heat. Add the remaining tablespoon of fish sauce, 2 tablespoons toasted rice powder, the brown sugar, and sliced red onions. Stir until well combined. Cut the cucumber into matchsticks, and slice up the spring onion and chili peppers into fine rings. Chop the cilantro and mint. Add the cucumber, chili pepper, most of the spring onion, mint and cilantro to the chicken mixture. Stir until well incorporated. 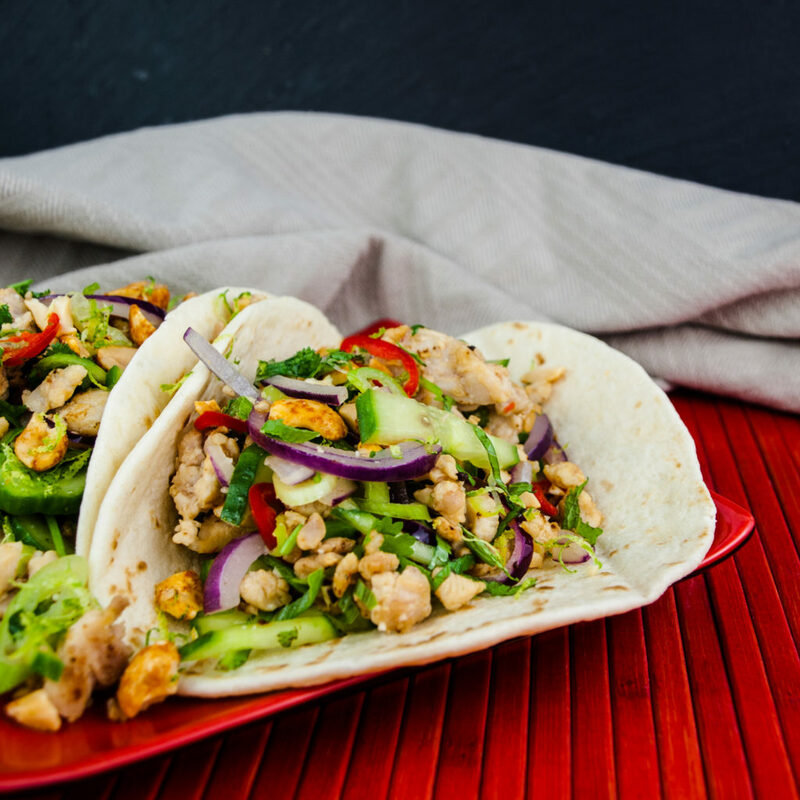 Place the filling on the tacos and sprinkle with the remaining sliced spring onion, as well as the roasted peanuts and remaining rice powder. Sprinkle the lime zest over your tacos and serve them immediately! What are your thoughts on larb? Have you ever tasted it and think my recipe needs tweaking? Which version is your favorite (chicken, pork, duck, mushrooms…)? Share your thoughts and suggestions with us in the comments below!